This photo shows the area between the first and second holes. The left side is the golf course and the right side is the Pinecrest community. Photo by Sarah Oberther. Want more birdies the next time you’re on a golf course? Just look around. There’s been an increase in wildlife, including the number of birds, at Fairfax County Park Authority golf courses. That’s because we’re consciously merging the entertainment and sporting missions of the parks with our responsibility to protect natural resources. Look outside the fairway, beyond and away from the next dogleg or sand trap. Natural resource protection areas are not in key playing areas of the golf courses. “We sneak them in around the perimeter and in between holes as much as possible,” said Pinecrest Golf Course Manager Sarah Oberther. The park’s Hole by Hole Guide to Environmental Stewardship shows the location of some of Pinecrest’s natural resource areas, such as woods, shrubs, tall grasses, brush piles and riparian buffers. Some of these areas protect resources under the guidance of the Audubon Cooperative Sanctuary Program for Golf. Audubon International, based in Troy, New York, provides environmental education and supports sustainable management of natural resources. The organization certifies places like golf courses, cemeteries, ski areas, and hotels that have an environmental plan and that meet certain established land management and resource conservation requirements. More than 3,000 sites have been certified for reaching those standards. Pinecrest and Laurel Hill are two of them. There are Audubon certificates of recognition in six categories – environmental planning, wildlife and habitat management, outreach and education, chemical use reduction and safety, water conservation, and water quality management. Golf Enterprises Manager Peter Furey says Pinecrest and Laurel Hill are fully certified in all six. Pinecrest received its first certification, for environmental planning, in April 2011 and was fully certified in July 2012. Laurel Hill received full certification in February 2009. The Park Authority’s other five courses are working toward certification, and Furey said he anticipates that will take 12 to 24 months. That would bring certification to other courses sometime between 2015 and 2017. Oberther said the program’s impact is “priceless.” Audubon sanctioning confirms that “we have reduced our carbon footprint while increasing native habitats and wildlife.” The site has substantially reduced its use of pesticides, fertilizers and water, and labor costs are lower because less mowing is needed. “This is absolutely the best way for any golf course to be environmentally accountable,” she said. Pinecrest is a good example of steps being taken at Fairfax County Park Authority golf courses to protect natural resources. To meet the Audubon requirements, Pinecrest documented its fertilizer and pesticide use, monitored water quality, then made changes and measured improvements. Some changes involved strategically selecting areas to filter, such as those with water. There are plants around the ponds on the Pinecrest course in strips from three to 25 feet wide. These are vegetative filters of Bermuda, fescue and native plants that grow with no fertilizer or chemical help. Water that runs through drains and culverts and feeds the course’s ponds and creeks filters through these vegetated areas. There’s also a riparian buffer along the creek that filters more water. The runoff is primarily water from streets of developments that surround the golf course. There is a 25-foot wide no-spray zone around water features on the course. In addition, Pinecrest has converted its fairways to Bermuda grass to reduce the demand for pesticides on the course. The Bermuda grass conversion allowed staff to eliminate all fungicide applications on the fairways for the past three years. The protection of resources doesn’t stop with certification. 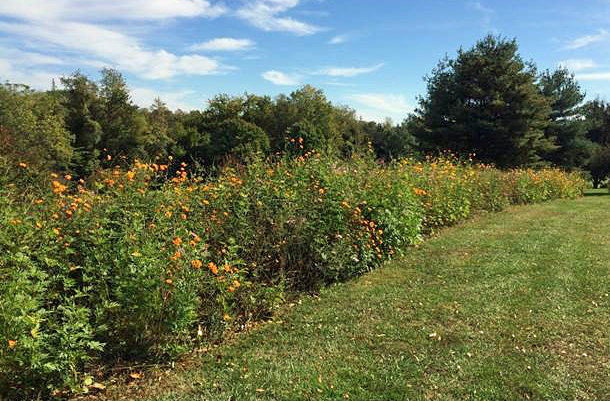 “This year (2014), we have planted wildflowers in our designated environmental protection areas that border our golf course and surrounding homes,” Oberther said. She added that the protection areas are “spectacular” when the native flowers are in peak bloom. To get an idea of the program’s local impact, peek at the Wake Up Pinecrest video in the Park Videos box on the Park Authority’s home web page or at the videos on the Fairfax County Park Authority’s website for golf courses and take note of the sights and sounds of nature in those videos. Then see for yourself. Head out for a nature hike – and take along the clubs. Pinecrest Golf Course is at 6600 Little River Turnpike in Alexandria, Va. The phone number is 703-941-1062. 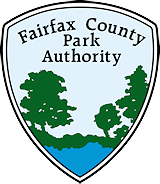 Information about all of the Fairfax County Park Authority golf courses is on the Park Authority website. This entry was posted in Uncategorized on January 16, 2015 by Fairfax County Park Authority.